A110-1 SNOW RVML EQUIP MAY BE ON RY. EQUIP HAS 2-WAY RDO & MONITORS FREQ 134.55 WHEN ATCT CLSD. ARPT MAY BE CLSD DURING SNOW REMOVAL. FOR CURRENT SNOW RVML EQUIP ACTIVITY CONTACT 134.55. 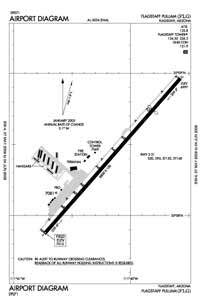 A110-10 RWY 03/21 WINDSHEAR & TURBULENCE AT BOTH ENDS OF RWY WHEN SFC WINDS EXCEED 10 KNOTS. A110-11 (A88) TOLL TO PRESCOTT. A110-12 (A89) USE FOR FSS ALSO. A110-13 ILS UNMON WHEN ATCT CLSD. A110-2 NOISE ABATEMENT PROCEDURE: AVOID OVERFLIGHT OF VILLAGE 3 MILES SOUTH. A110-4 CALM WIND CONDS USE RWY 21. A70 FULL AND SELF-SERVICE FUEL AVAILABLE 24 HRS. A81-APT ATCT. WHEN ATCT CLSD ACTVT HIRL RY 03/21, MALSR RY 21 CTAF. PAPI RY 3/21 OPER CONTINUOUSLY. E147 TPA: CONVENTIONAL ACFT 989 FT AGL, HELICOPTER 489 FT AGL, HIGH PERFORMANCE 1489 FT AGL.